The Capitol Quartet is widely considered among the most exciting chamber ensembles performing today. 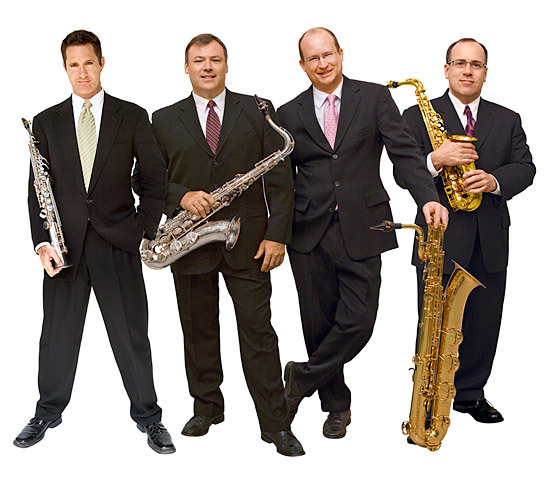 Comprised of saxophonists who are teaching faculty at America's leading music schools, the Capitol Quartet has captured the imaginations of critics and audiences alike. Combining innovative repertoire with virtuosic playing and an energetic, engaging stage presence, the Quartet brings a unique brand of entertainment to the concert stage. Since its formation in 1991, the Capitol Quartet has performed regularly at major concert venues throughout the United States, earning wide acclaim for the ensemble's musical versatility and innovative style. The Capitol Quartet's eclectic repertoire features contemporary works for saxophone, transcriptions of classical and jazz favorites, jazz originals, and traditional French quartet compositions. The Capitol Quartet is also committed to expanding the repertoire of the saxophone quartet, having commissioned new works for saxophone quartet by composers, Stacy Garrop, Evan Hause, Mark Weiser, Charles Ruggiero, John Fitz Rogers, John Anthony Lennon, Greg Wanamaker, Perry Goldstein, Whitney Ash, and others. A recent commission and premiere, Carter Pann’s The MECHANICS: Six From The Shop Floor, was named as a finalist for the 2016 PULITZER PRIZE in music. Dedicated to advancing music education, the Capitol Quartet regularly performs and lectures at National and State Music Educators conferences. They have appeared at the Midwest Band and Orchestra Conference, Illinois Music Educators Conference, Connecticut Music Educators Conference, Virginia Music Educators Conference, MENC Eastern Division Conference, NAFME Eastern Division Conference, American Band College, Bands of America's Summer Symposium, and many more. They have also performed masterclasses and educational programs at numerous schools and universities throughout the country. The Capitol Quartet has been featured with the Cincinnati Pops, Indianapolis Symphony, Rochester Philharmonic, Baltimore Symphony, National Arts Centre Orchestra (Ottawa, Canada), Windsor (Ontario) Symphony, the San Antonio Symphony, Long Beach Symphony, Virginia Symphony, Springfield (MO) Symphony, Roanoke Symphony, Imperial Symphony (Fl), Bay-Atlantic Symphony, Grand Rapids Symphony, the U.S. Air Force Heritage of America Band, the U.S. Continental Army Band, and many other symphonies across the country. In 1994, the Capitol Quartet won the prestigious Baltimore Chamber Music Awards Competition, and in 1997 released its debut recording: American Sketches on the Klavier Records International label. Acclaimed by the Baltimore Sun as "a tour de force," and by American Record Guide as a "delectable release". Other recent and widely acclaimed recordings include Balance (2015) on Blue Griffin Records, FLEX (2012) on White Pine Records, the 2001 Summit Records release "Anything Goes", and the innovative 2004 release "Dig" which showcases the Rochester Philharmonic with Jeff Tyzik conducting and producing. Famed American composer and entertainer Marvin Hamlisch says of the Capitol Quartet: "I have had the great pleasure of performing with the Capitol Quartet. Their fabulous sound, professionalism and innovative program all combine for a wonderfully entertaining musical experience." The Capitol Quartet proudly performs on YAMAHA Saxophones.